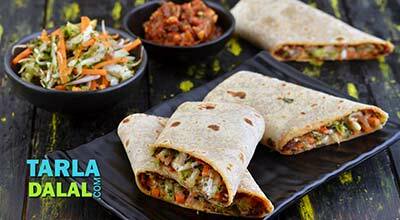 Paneer and onions marinated in a delectable curd and mint based marinade, makes this an irresistible tikka! The key to ensuring that the marinade doesn’t slide off the tikkas is to use hung curds and don't miss out the use of cornflour. 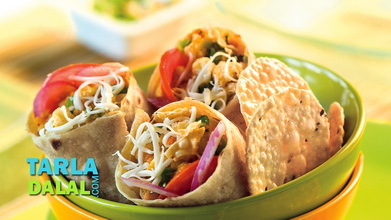 Wrap the tikkas with a handful of onion rings sprinkled with chaat masala for a simple yet delicious combo! 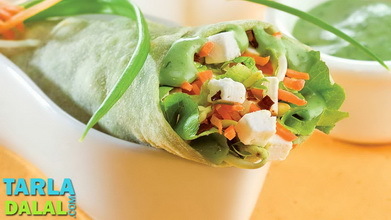 You can also try your hand at other wraps like Bean Sprouts and Veggie Wraps and Stuffed Corn and Capsicum Wrap . Combine all the ingredients, except the fresh cream and cornflour, and blend in a mixer to a smooth paste, without using water. Transfer the mixture in a deep bowl, add the fresh cream and cornflour and mix well using a whisk. Keep aside. Combine the pahadi marinade, paneer cubes, capsicum cubes, onion cubes in a deep bowl and toss gently. Cover it with a lid and keep aside to marinate for 10 minutes. 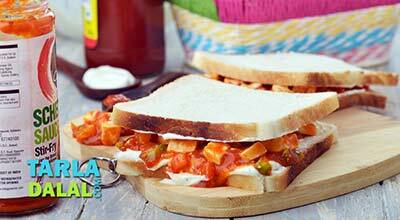 On a satay stick, arrange 4 pieces each of capsicum, paneer and onion cubes alternatively. Repeat with the remaining ingredients to make 3 more satays. 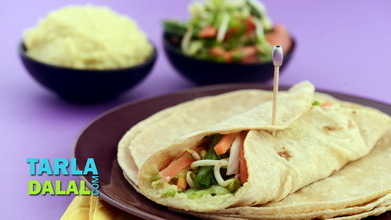 Heat a non-stick tava (griddle), grease it with little oil and cook the satays on a medium flame using little oil or till the paneer is golden brown in colour from all sides. Keep aside. 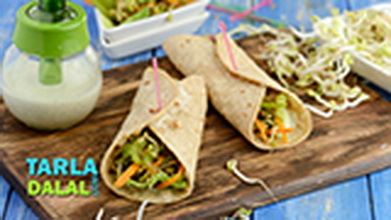 Place a roti on a clean, dry surface, spread ½ tbsp of garlic mayonnaise evenly over it, put 1½ tbsp of cabbage and carrot in the center, slide 1 paneer tikkas from 1 satay stick in a single row in the centre of the roti, put few onion rings and finally sprinkle little chaat masala evenly over it. 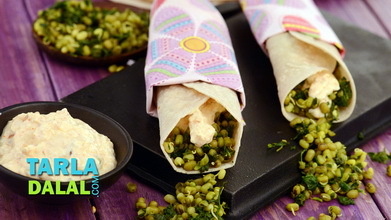 To roll, fold the two opposite ends of the roti over the stuffing. 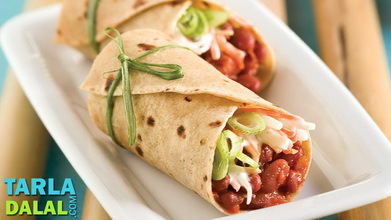 Start rolling h roti from one open end over the 2 folded sides. 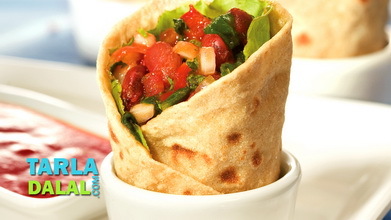 Roll the entire roti tightly and wrap a tissue paper around it.